When creating a Graph view for an arbitrary selection of elemens, it is possible that there are cyclic dependencies among the elements that make part of the content of the view. In this case, it would be impossible to define levels among the elements that belong to a cycle and with all of them belonging o a same level, the readability of the graph would decrease. To avoid this effect, Sonargraph gathers all elements that form cycle groups into elements called "On Demand Cycle Groups". For a quick reference of the elements that are involved in an On Demand Cycle Group, hover the node with the mouse and a tooltip with appear with the list of cyclic elements. 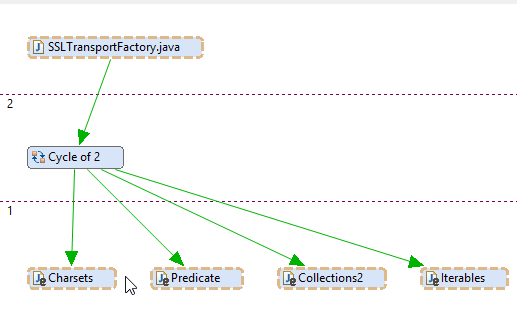 For a detailed view of the cyclic elements and the dependencies involved, right-click on the node and select "Show in Cycle View"